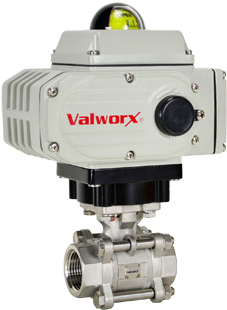 Valworx 565361A electric actuated 3-piece stainless steel ball valve is used to control the flow of water, air, oil, and other media compatible with the materials of construction. The valve has a unique three piece investment cast bolted body design with the advantage of a swing out body for easy inline maintenance. The EPS- Electronic Positioning System provides an accurate valve positioning function whereby the movement of the actuator is controlled by a 4-20mA input control signal. Any change in the control input signal results in a corresponding and proportional change in the position of the ball. The internal microprocessor and closed loop feedback system continuously monitors and maintains accurate valve position. The valve will remain in the last known position with loss of electric power. The positioning module is self-calibrating and fully potted to help protect the electronics against vibration and moisture. Valve position can be monitored with onboard analog output signal. The valve is direct mounted to the actuator using the international standard ISO5211 mounting pad. Rugged unique integral motor/housing design provides higher torque in a very small package. 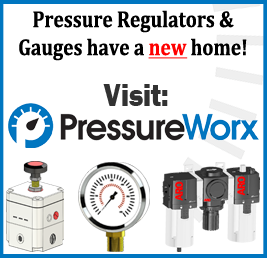 Actuators are tested to rigorous UL and CSA standards and certified by CSA. Anti-condensation heater is standard and will help protect actuator against damage caused by condensation. Maximum media working temperature is 158 °F (70 °C). Order optional high temperature valve mounting kit to extend media working temperature up to 266 °F (130 °C). Suitable for steam service up to 25 PSI max. with kit.